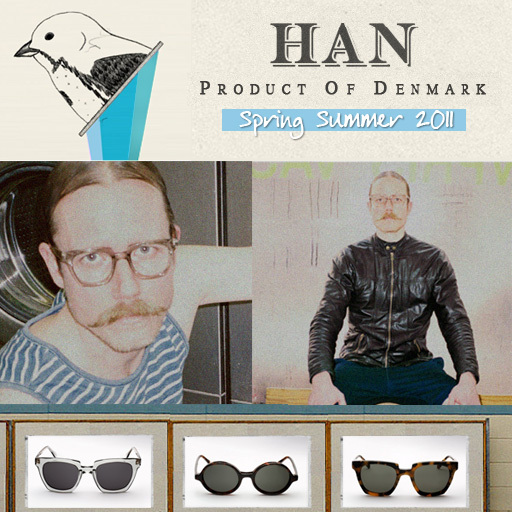 New from Denmark, the latest Spring Summer 2011 offerings from Han Eyewear are now available. Keeping with the brands timeless aesthetic, this season Han plays with conventional shape to offer two unique new styles: “Union” and “Doc”. Each model, from its style to its name, recalls a certain era of history. The Union, features sharp lines, thick acetate and “is inspired by 1970’s welding glasses. The frame is bulky, but with characteristic clean Danish lines.” Available in transparent grey, solid black, and army tortoise. The Doc, with its perfectly circular lenses reminiscent of the 1920’s and “8mm deep cylinder shaped front”, is truly deserving of its name: “Doc”. Available in black and tortoise, and as both a sunglass and eyeglass.